Just because you may not have Nestabilities doesn't mean you can't have shapes! (Don't get me wrong, I luv my Nesties)...but not having them doesn't limit you to square mats on your cards. 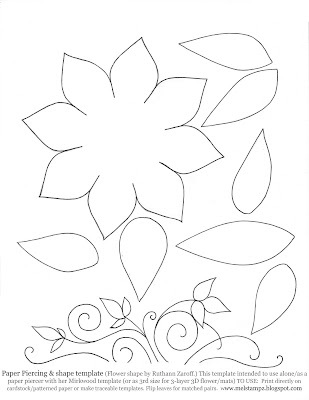 Step 1) Print or trace flower template on back of patterned paper or cardstock. Step 2) Cut flower out. Step 3) Adhere flower to black textured cardstock. Step 4) Cut around (using the patterned paper flower as a guide) to make a black mat layer. If you're not comfortable cutting freehand, you could print the flower template using scaled printing just a bit bigger than the original. Step 6) Adhere the patterned paper to the black mat & pierce, if you like. TIP: If sewing or faux-sewing, add adhesive where you won't hit it when you pierce holes around your square... I've had many a mucky needle from adhesive, LOL. Step 1) cut a circle & stamp just the curly tail on it. The round sentiment is from the Farmyard Friends kit too. Gotta love the teeny cupcake on it! I like this card!!! It's nice! Love the card and just too creative as always, lady! Awesome tut!! Thank you for the how to for the shaped layer. Would never have thought of that. Now I have to figure out where I'll use the flower I printed out. So cute! Thanks for showing and explaining all the steps. Thanks for the template too! This card is fantastic! I love the paper pieced little piggy and her awesome hat! Thank you for sharing the templates and tutorial, Mel! First off, I have to tell you I love how you are organizing your posts! I love all the detail you are giving. That little piggy hat and the paper piercing and crystals around the circle are GREAT! Thanks Mel, that is different. I save your downloads with by Mel on the end so I know who I got them from, I have a few unidentified ones, and some come with clues built into the name which is very helpful. Just a thought. As for cutting freehand - nah, can't cut at all well. So it will be resizing for me. As always, your tutorials are so thoroughly detailed even I can follow them. It's like I'm in a class with you all by myself. I'm so happy when you include printable templates for those of us who don't have all the fancy gadgets (yet). This is such a cute card, I laughed all the way through the steps. Thanks, as always, for sharing your wonderful talent and sense of humor -- oops, I'm on your home turf, so that be "humour." Mel - I left a little something for you on my blog - you have an amazing talent and I thank you for sharing it with us! SUPER cuteness! Thanks for the tute! So cute! Thanks for showing us how to and the fab details. You are just awesome!!! I love how you show us step by step directions! I come to your blog all the time to find inspiration!!! You are just Amazing!!! Thank you for all your creative inspiration! Hey Mel! You're making that pig nervous saying "ham"! LOL! I love your cute piggie! You're so detailed. . even layering over the nose. I think a flowery nose is okay! LOL! Wow, thanks for the template. I think I may just need to use it for my next project. I haven't created a flower shaped card for a while now!! Believe it or not, I have only two Nestie shapes. I've been avoiding buying everything because I have the Craft Robo and my husband gives me funny looks when I buy a die. He's like. .why did I get the Craft Robo? LOL! I love your attention to the details. Your directions are the best. Just plain beautiful ! Its such a wow card and you have explained it in such detail. Wow!